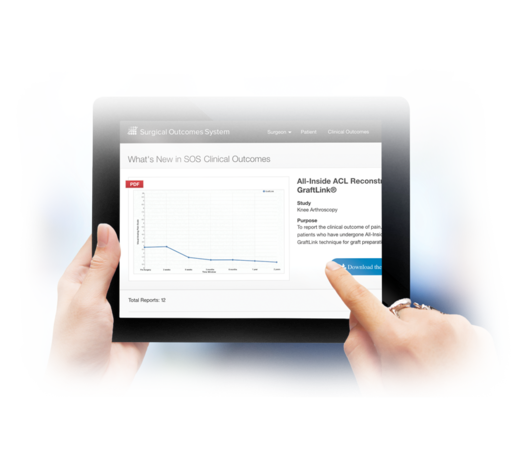 The Surgical Outcomes System (SOS) global registry is a web-based platform for collecting patient-reported outcomes. The registry allows physicians and their staff to create treatment templates for documenting consistent diagnosis and procedure information. Patients are able to share in the decision-making process related to their own treatment and recovery. Physicians can access patients' outcome data and compare it to the global deidentified average, and opt to share the information with patients. The SOS™ global registry can interface with electronic health records, alerting the physician if a patient's pain threshold has deviated from expectations. Participation in the SOS global registry contributes points within the Quality, Promoting Interoperability Performance, and Improvement Activities categories of the Merit-based Incentive Payment System (MIPS) within the Quality Payment Program (QPP). Arthrex has collaborated with the Arthroscopy Association of North America (AANA), American Shoulder & Elbow Society (ASES), American Orthopaedic Society of Sports Medicine (AOSSM), and the Eastern Orthopedic Association (EOA) to provide access to the SOS registry as a member benefit. Enrolled physicians and facilities own their data. How Does the SOS™ Registry Provide Immediate Actionable Data? Where is the SOS™ Registry Today? How Does the SOS™ Registry Align with Reimbursement Initiatives? What are the SOS™ Registry's Upcoming Initiatives? How is the SOS™ Registry Unique? What Information Can Physicians Track Using the SOS™ Registry? How Can Physicians Increase Patient Satisfaction Through the SOS™ Registry? What is the SOS™ Registry's Philosophy on Data Collection? What Data Do SOS™ Registry Customers Have Access To? Who Owns Data Collected Within the SOS™ Platform? Which Physicians Are the Ideal SOS™ Registry Users?